With the imminent launch of the iPhone 8, iPhone 8 Plus and iPhone X ahead of us, it’s time to start thinking about the path forward for smartphones. And, yes, that means ditching your old clunker in favor of a brand-new flagship. Still, the move to a new iPhone is almost never a straightforward process. Unless you’re shelling out cash every month on iCloud storage, it can actually be quite daunting – whether you’re currently on iOS or even Android – to transfer your old data over to a new device. Luckily, there are systems in place to relieve you of some of the headache. Of these is AnyTrans, a piece of software developed by iMobie for Macs and Windows PCs that’s known to some as the better iTunes. 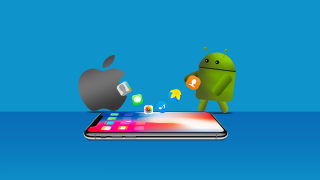 Complete with the same file management services that iTunes offers, albeit without the cumbersome interface, AnyTrans offers seamless data transfers between both Android and iOS devices. In many ways, it’s even better at this than its rivals which only carry out data transfers. Take Move to iOS, for example. This is an app specifically designed for Android users to, well, move to iOS. The difference is that AnyTrans can accomplish so much more while moving data from either an Android or iOS device. While neither service has trouble moving text messages, photos, videos and contacts, only AnyTrans will import music, call logs, downloaded videos, ringtones, books and documents to your next phone. What’s more, AnyTrans lets you personally select which messages and files you want to transfer, whereas the competitor opts to move everything over without your input. Unlike Move to iOS, AnyTrans gives you the autonomy to personalize your upgrade to the latest iPhone. If you’re an Android user who’s kicking it old school and still downloading your music and movies rather than subscribing to streaming services inhibited by frivolous monthly charges, you’ll be disappointed to find that Apple’s iPhones don’t play so friendly with these formats. If you tried to transfer these files manually to an iPhone 8 or X, you would quickly discover that it’s not that easy. Instead, you would need to convert your movies and music to an iTunes-friendly format, a task that AnyTrans can accomplish for you, automatically. That’s right, with AnyTrans’ iOS Mover feature, you’ll be able to keep listening to your favorite albums, watching your favorite movies and reading your favorite books stored on your Android device, less the inconvenience of converting them to new file formats. When you use AnyTrans to make the move from an Android, or older iOS, device, you’re doing so knowing with confidence that you wouldn’t get a better transfer anywhere else. Because there are so many unique facets of AnyTrans, it’s simple and unique to use. For one, you don’t have to factory reset your new iPhone before migration. If you’ve already started using it to store new photos, send and receive messages and so forth, AnyTrans won’t overwrite anything. So you don’t miss out on anything by purchasing the software later. Better yet, AnyTrans does everything over USB. This differs from other products on the market that are unfortunately limited to Wi-Fi transfers, which can notably be sluggish and put your device at risk. In comparison, AnyTrans promises a transfer that is 100% stable and secure. Performing a complete device transfer is fortunately as simple as installing AnyTrans on your PC or Mac after downloading it here. From there, launch the program on your computer and connect both the new device and the original device whose data you’re trying to migrate. Then, if the original device is an Android, locate the iOS Mover menu and click it. Once the Android device is recognized, choose the “Content to iOS” option. You’ll then be able to pick which categories you want to transfer from and, on the next screen, the process will begin. The former will move data over to the new iPhone without overwriting the contents of the target device while the latter will replace data on the new device with that of your previous iPhone. It’s up to you which method you want to choose, though we recommend merging devices. And that’s it. AnyTrans is that easy to use. Plus it doesn’t hurt that it only costs $39.99 for a single license. At the same time, there are discounts in place for users planning on installing AnyTrans on two or even five computers, priced at $49.99 and $59.99, respectively. The iPhone 8 is an incremental update over the iPhone 7 – it’s strange that Apple decided against the 7S name here, as there’s not a lot of new technology on offer beyond the improved screen and faster innards.